Client-side and server-side are the two ways to collect and deliver data– but each approach comes with its respective benefits and drawbacks. Tealium offers customers both client-side and server-side options, so you have the power to make the right choice for your data strategy, business needs, and budget. Want to know how to choose whether to track and/or deliver data on the client-side or server-side? Or when you might need both options? 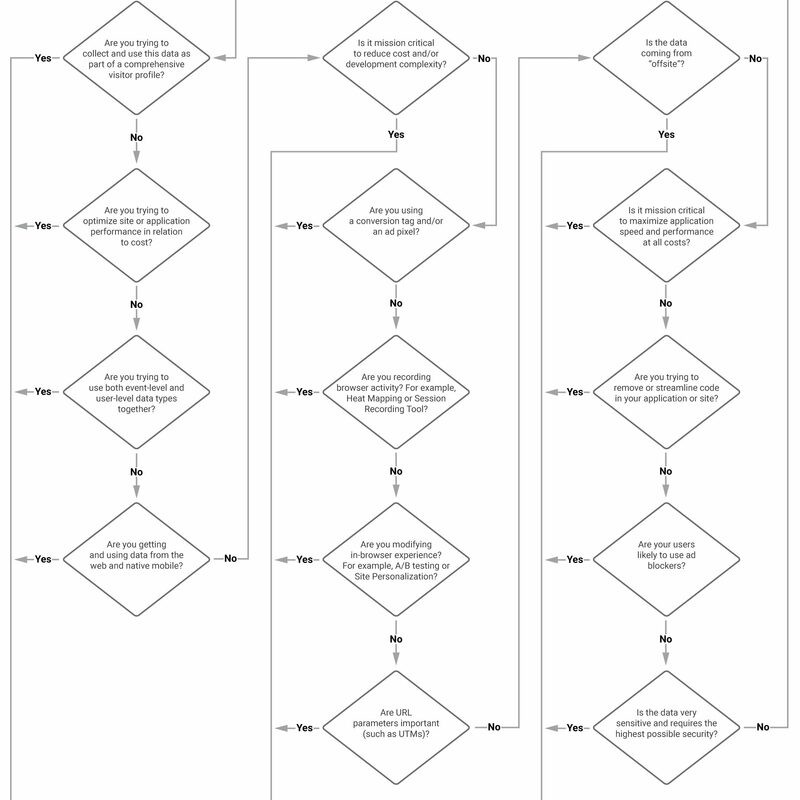 Check out our client vs server decision tree for more info. What is client-side and server-side tracking? Client-side delivery of data is commonly accomplished through tags, one of the most popular ways to transmit data from web pages. This type of tracking involves the user’s browser (client) directly sending data to a server. The method is used for collecting and sharing data from your website to your marketing technology vendors and is referred to as tag management. Server-side data management, also known as cloud delivery, is when a pixel or tag sends data into your web server (or a different type of server), then your web server passes that data to the destination system/server. This data could be used by a marketing automation platform, analytics provider, personalization tool or another type of execution system. When a single, consolidated pixel or tag is used instead of one tag/pixel per destination system, this is called an event gateway system (also known as an API Hub), with one example being Tealium EventStream. This is where one, central system functions to collect all data, then that system relays data to third-party vendors. This action simplifies the collection and delivery process by sending one data stream to a cloud-based repository, and then the data is sent to your vendors. Client-side tracking has the advantage of taking place on the user’s device, giving direct access to user-specific data, such as cookies, URL parameters, user agent, referrer, and IP address. By collecting on the client, you can easily collect and track all of these pieces of information to use to trigger other actions. Data like cookies are commonly used for ad targeting. Location data can be used for personalization among many other uses. And URL parameters and/or user agent are typically used to analyze marketing campaigns and customer engagement. There are specific client-side tags such as the Google Publisher Tag, Optimizely or Certona that need to run in the browser to get this rich contextual data to personalize experiences, display ads or dynamic content to visitors. Client-side tracking also has an advantage when it comes to how easy it is to install. Many vendors supply a snippet of code that’s as easy as copying and pasting to implement. Client-side tracking tags have also been standard practice for many years, making it a common task in the industry. Data transmission costs for client-side tracking are usually lower cost. Server-side transmission leads to higher costs due to leveraging 3rd party vendor resources in the cloud instead of the target user’s device. Tracking on the client-side involves potentially millions of devices and scenarios, leading to an increased likelihood that something impacting data transmission could occur. Server-side tracking is generally more reliable because the scope of data management is greatly reduced and the organization can exert more control over the transmission. Server-side tracking isn’t as susceptible to data challenges due to client-side issues like an interrupted connection or an over-active ad blocker being installed. Server-side tracking also has the advantage of removing the processing burden from a client’s device and moving it to the cloud. This results in less work for the client’s device, which can lead to increased application and device performance. A faster application that consumes less battery improves customer experience and can greatly improve conversion rates. The Tealium Event Data Framework gives you options for data management both client-side and server-side. Gain agility to leverage data as needed by your customer’s venue or your company’s technologies. Get the details. Nimbly tracking and delivering data on either the server or client-side is not easy without taking steps to establish a data foundation that simplifies the process of defining and accessing data. Establishing a modular and vendor-neutral data foundation unlocks the maximum benefits of optimizing the client-server data management balance. Tealium takes a data layer approach (combined with an easy-to-use management interface) to establish a taxonomy of data that can be accessed from any location customer engagement occurs. This greatly simplifies the process of leveraging data, whether done client or server-side. Not every situation warrants, or is capable of, cloud delivery (server-side) for data collection and delivery. Oftentimes, traditional client-side tags are the optimal solution and it’s critical to have flexible capabilities accommodating both traditional and emerging data management practices within the same platform. Learn the critical considerations for choosing between client-side and server-side data management, and when it’s critical to have both options, in our Client vs Server decision tree.